MARKFIELD - a village proud of its history. The website is maintained by the Markfield Local History Group. Our recently completed projects include establishing the new war memorial, producing an updated village trail leaflet and installing history plaques on buildings across the village.The Group pages list forthcoming meetings, please come along and meet us and hear our speakers! We are happy to try to help with family history research and other questions - please get in touch via the Contact page. Alternatively, leave a Guestbook message which will be published and hence other visitors to the site may be able to help too. Our next meeting will be on Tuesday 21 May, at 7.30 pm. Tony Wood will speak about more historic medicine in Markfield. See further details of our 2019 programme. Highlights of previous meetings can be found in the Group's area of the website. 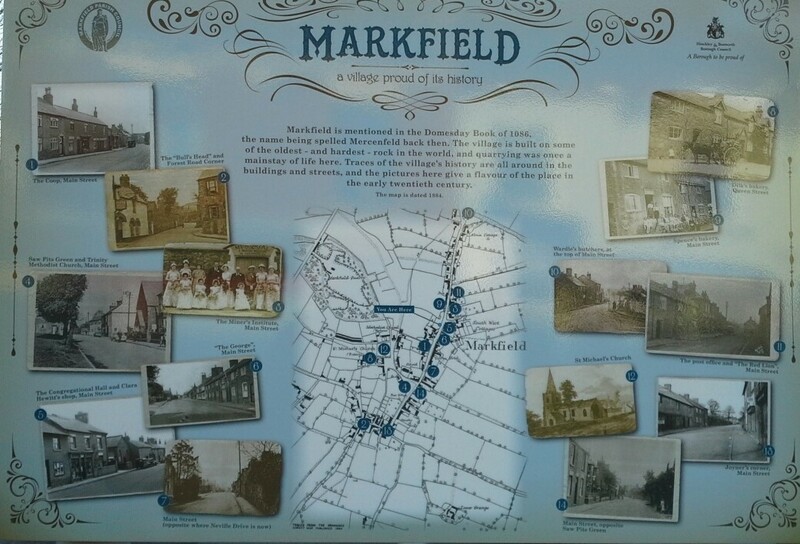 Share your photos, memories and stories of Markfield! If you have old photos, memories or stories of Markfield that could be shared on the website, please e-mail MarkfieldHistory@Outlook.com, or get in touch via the 'contact us' page. Markfield village, known as Mercenfeld in Anglo-Saxon times, is situated on the A50 near J22 of the M1 Motorway, on the edge of the ancient Charnwood Forest. This was formerly the Ashby to Leicester Turnpike Road, in the days when tolls were payable. Markfield is one of the highest villages in Leicestershire, some would also say it is one of the coldest! It is home to very old and very hard volcanic rock called Markfieldite, has stone cottages, a disused quarry open to public access and lots of interesting history. As with many villages, the speed of development has increased significantly, with much new housing developed over the last forty years. Many residents now commute to work and leisure activities, using the access to the M1, M69 and A50 - a far cry from the world of less than 100 years ago when most people worked in and around the village. They would have been engaged in stone quarrying, coal mining, framework knitting and farming in particular, alongside the usual range of village trades and shops. The residents shopped and drank in local shops and pubs, being much more self-sufficient as families and as a community than is the case in more modern times. This year marks the one hundredth anniversary of the end of World War I. Locals recall memorials on the walls of the now demolished Institute, although their present whereabouts are not known. If anyone has any information about this, or any photos or other memorabilia which they would like to share with the group, please contact us. Carnivals at Markfield were filmed over several years, probably from c1937 to 1939, by local cinema manager George Weston who ran the Majestic Cinema at nearby Ratby. The carnivals appear to be in aid of the Leicester Royal Infirmary. They are great to watch! If you can name any of the people or identify any of the more obscure buildings, please let us know via the Contact page. Historical details of the men named on the village war memorial are being added to this site. Read more about their family background, military service and contemporary press reports. Local historian Di Lockley has published a new book for 2019. The 'Markfield Times' is a collection of newspaper reports about the village and its people stretching back some 250 years. Read about disputes, crime, transport, poverty, livestock, pubs, schools, drunkenness, religion and many more fascinating and interesting topics. Printed in a limited edition, copies cost £6.50 and are available from the community library or by leaving a message via the contact us page. Local historian Di Lockley researched a publication to allow those with a family history, linked to the village of Markfield, a chance to view the names in the very first Parish Register from St Michael’s Church, which dates from 1571 to 1784. This fascinating list can now be downloaded as a pdf file. 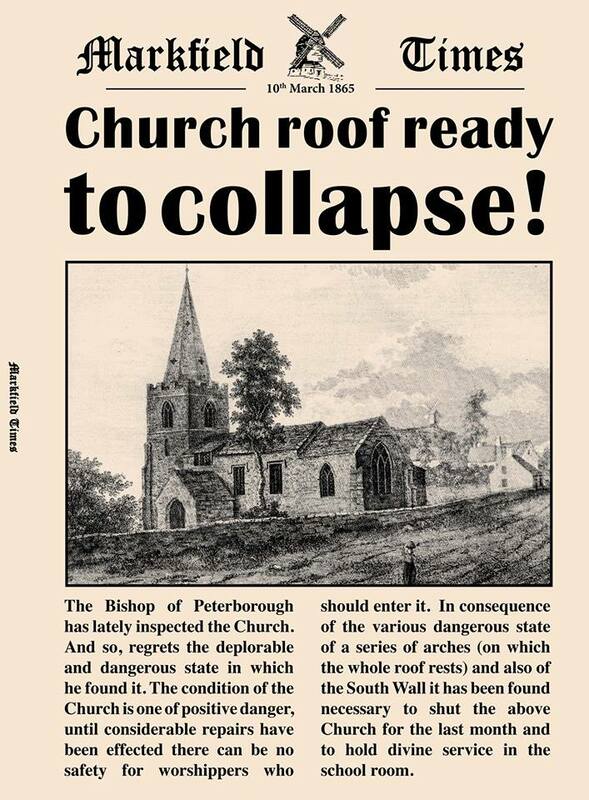 See the Religion and Churches section of the website. The Sanatorium / Hospital page has been updated with narrative about letters written by a patient in 1940. Read about our 2018 meetings. We have learnt about early medicine in Markfield, the early years of state education in the village,Taylor's Bell Foundry, the Greyfriars Friary in Leicester, and fascinating recollections of Markfield by a former resident. We also led the annual village history walk in July.